We all want what’s best for our babies, but sometimes we rely too much on the traditions of previous generations to make critical decisions for them. When it comes to feeding babies food for the first time, some practices are sticking around, despite the fact that many, if not all, of these practices are absolutely myths. Years before I ever had any of my own kids, I would watch and observe how my oldest sister cared for her kids, including how she fed them. I really didn’t have any kind of opinions because most of what she did was just normal. She fed her kids rice cereal, just like most parents do. She gave her toddler juice (half water and half juice), just like most parents do. Then I had my own kids. And I started questioning those common practices that most parents do. Here’s what I realized: Kids are being fed junk from the start. I was not going to continue the traditions of the past and give my babies foods that eventually lead to poor health. And, so, I did things differently. And I still do so many things differently. I refuse to cling to what’s normal in feeding kids these days. 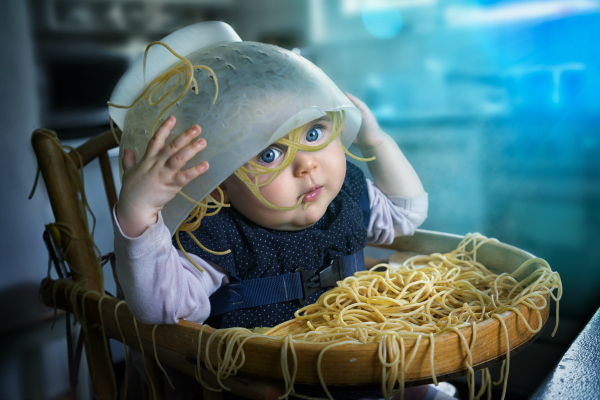 6 Baby Feeding Myths – Debunked! I’m ready to debunk a few feeding myths that so many people still believe. The more research I do on baby rice cereal, the more I cannot believe that doctors still push it. 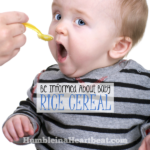 Commercial baby rice cereal is not the best first food, and in fact, it should be completely left out of your baby’s diet if you want them to be healthier. I personally give my babies simple fruit and veggie purees to start. No commercial baby rice cereal in sight, even to thicken up purees. Here’s my in depth post about commercial baby rice cereal and why it’s just not a great food to feed your baby. Why anyone would believe this is beyond me. Why wait to give your baby something tasty? No wonder why so many babies don’t want to eat. They are being fed bland food that has little to no nutritional value. Babies can tolerate spices very early, even as young as 6 months if you want to start then. Think about it, babies all over the world eat foods with spices from a very young age. 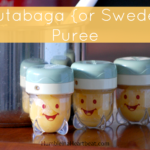 Check out this awesome resource to help you add spices to your baby’s food. The research has shown that most allergies stem from family history, not because a food was introduced too early. It used to be recommended to wait on peanut butter until a child was 3 years old, but that is not the case anymore. Sure, a child can develop an allergy to peanuts at a very young age, even without a family history of peanut allergies, but waiting to introduce it won’t keep it from happening. What you should worry more about is choking hazards, which is one good reason to not give a baby a nut or even peanut butter. It just is not a good idea to give a baby, especially a 6 month old, something that could get stuck in his throat. Here’s a great list of 50+ finger foods that babies with few teeth can eat, even at the tender age of 6-12 months old. It seems logical that if a baby eats vegetables first, say for the first month or two, that they will enjoy those veggies much more than if they had eaten fruit for the first month or two and then started on veggies. But it doesn’t always work out that way. Here’s my theory: It’s more likely for a parent with a sweet tooth to introduce fruits before veggies, and thus the parent will continue giving their child sweet foods on a regular basis, and this is why the child will prefer sweet fruits over veggies. Of course, that’s just an observation. If you are a parent determined to give your child a healthy start, you will push veggies from the get-go and continue to push them on a regular basis. Your child will likely enjoy veggies much more than his peers in this instance. Again, I am just sharing a hypothesis that is not based on facts. However, the research clearly shows that it really doesn’t matter the order in which you introduce foods to your baby. A 6 month old breastfed baby needs extra iron in his diet because mom’s breastmilk is no longer giving him the adequate amount. Therefore, it is actually quite logical for a baby starting on solids to begin with meat and other protein sources which contain the iron that baby needs. In fact, bone broth, egg yolk, and liver are all foods that many people, especially in other cultures, introduce to their babies first because of the adequate supply of iron and the amazing nutrients they pack. Admittedly, this one drives me crazy. Here’s a fun little scenario: You give your baby some pureed peas, and he immediately spits them out. Maybe he even starts smearing the peas all over his high chair tray, his face, and in his hair. This awful behavior doesn’t necessarily mean he doesn’t like peas. It also doesn’t mean you should never give him peas again. It could mean that maybe he’s not so hungry right now. Most likely, though, your baby just needs some time to develop a taste for peas. This is true for many vegetables. Have you tried those pureed peas your baby just splattered all over the kitchen floor? They aren’t so tasty, especially if they came from a jar at the store. In this case, continue to offer peas to your baby, but next time give it to him cooked differently. Make it tasty. If even you wouldn’t touch the food, why would your baby want to? 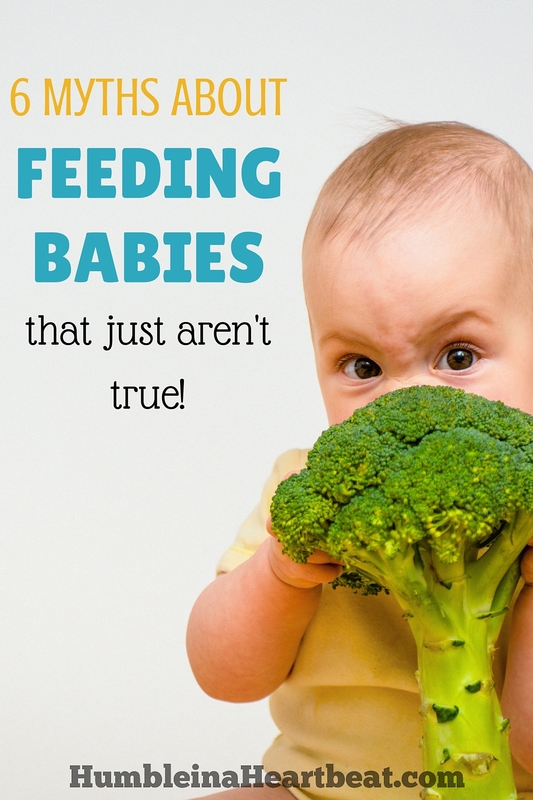 Did you realize there were so many myths about feeding babies solids? Feeding your baby solids should be taken seriously because what you feed him now really can have lasting consequences. More kids than ever are obese and generally unhealthy, and you can do your part to end this awful epidemic. 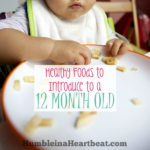 Starting your baby on fresh, real food is not rocket science. Yes, it takes time. Yes, it takes forethought. But your baby deserves the best. If you want to learn more about feeding your baby a fresh, real food diet from the start, get my new book, Raising a Child with Variety: The Baby Stage. Oh, and here is a post all about the adorable printables included with the book! I recognize many of these myths! Especially the one about starting with rice cereal and not giving tasty food. Our pediatrician said to give any food before age one except for honey, and that introducing food actually decreases the chances of developing allergies. I’m with you on these myths! Your pediatrician is a lot different than the ones we’ve talked to! It’s so important for babies to enjoy their food, and when they are given something as bland as rice cereal, how do we expect them to do that? Thanks for your comment, Nina! some of these “myths” are common sense, some are interesting, some are questionable….but in the end they all lose their lustre to me since the article just seems to be a push to buy a book. So I am not fond of rice cereal but I do use baby oatmeal, but I use it as I would regular oatmeal. I mix it with apples and cinnamon for breakfast. We changed pediatricians with my children because our first pediatrician moved to a new practice. She also said to give any food before age one except for honey, and that introducing food actually decreases the chances of developing allergies. She encouraged table foods like scrambled eggs. My parents thought I was crazy when I told them to try my daughter with anything. My daughter does experience some food allergies but they are not life threatening and we have determined that they are worse when she is exposed to more processed foods. My mother-in-law just couldn’t believe some of the foods I would give my babies, because when she fed her own there were really only a handful of foods that were recommended. I’m so glad there’s more research and studies to prove that eating pretty much all real foods before age 1 is a-okay!